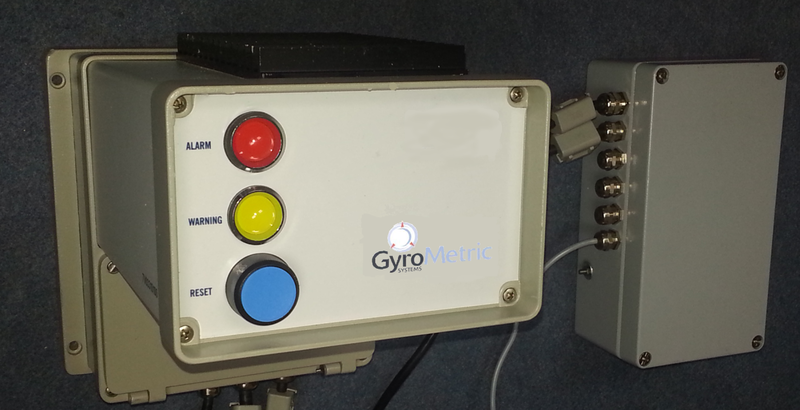 The Gyromon System is a monitoring system for mechanical equipment which includes rotating shafts, consisting of a central control box containing an embedded PC and between one and eight remote connection boxes communicating by Ethernet. 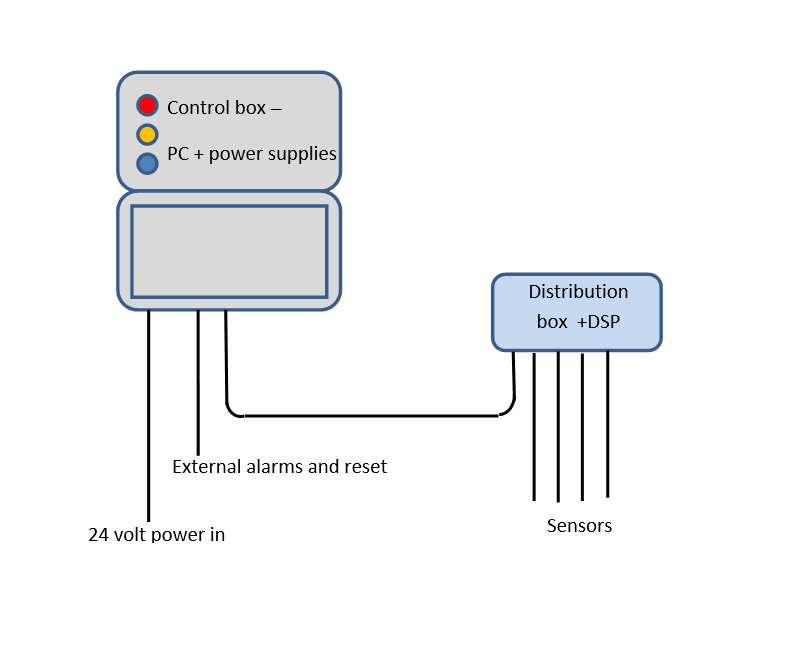 Each connection box is equipped with a Digital Signal Processor and may be connected to a range of sensors for different measurements. The system is capable of digitally monitoring radial shaft vibrations in two axes, actual radial shaft displacement, torsional vibrations, shaft speed, and torque. The system may be used independently of external communications, when two levels of warnings may be given for any parameters which move over preset limits. There are warning, and alarm lamps on the control box for these two levels, supplemented by internal relays which can be used for audio alarms, or shutdown signals for a control system. Warnings alert engineering personnel to parameter values over limits. Detailed information relating to the alert can be seen by interrogating the system with a laptop, logging on via the internet, or intranet, or by using an optional, installed touch screen. Used in conjunction with external communications the control box can be connected via an externally accessible waterproof Ethernet socket. Information is logged to a database which is stored on removable media. The enclosures are designed to IP67 with an ambient temperature range of -20 to +70 degrees C.
When connected to the internet, the system may be interrogated via a remote PC, displaying the values of all the parameters calculated from the instrument inputs. 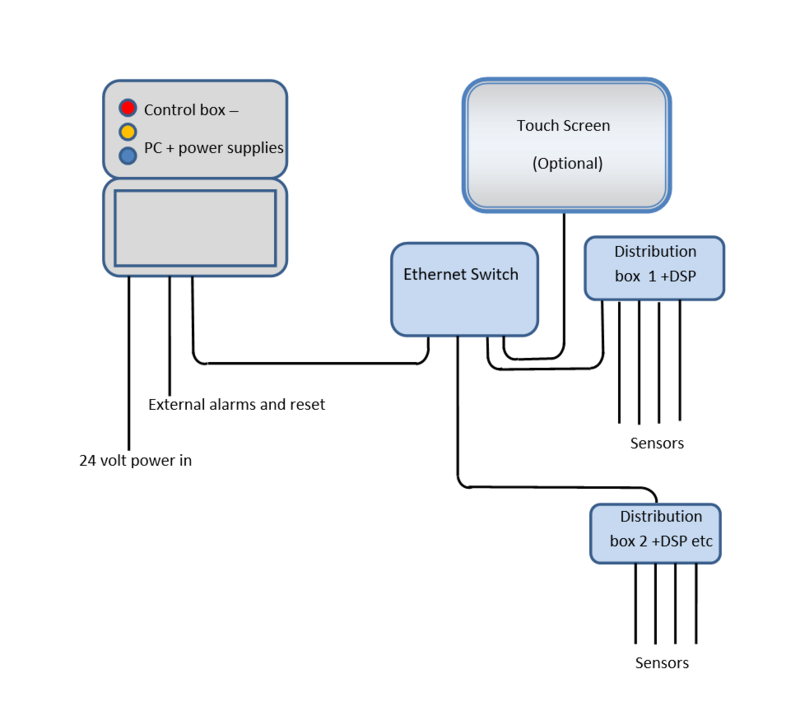 Connections from the Control box enable warning states to be displayed in a control room, external systems such as automatic shutdown activated and for warning resets to be carried out remotely. The Gyrometric measurement system analyses the flow of signals from shaft encoders. The principle functions on all sizes of shafts from very small to very large. On small shafts conventional encoder discs are usually used with additional read heads. On very large shafts versions of encoders have been used which consist of laser cut toothed discs attached to the shafts with inductive proximity sensors providing the flow of signals as the teeth cut into the disc pass the sensors. Where required accuracy is not high reading patterns of bolt heads on coupling discs has been used. Equipping existing, or specially attached gear wheels which are running on the shaft with gear tooth sensors is also an option. Torsional vibration measurements are useful for detecting problems with transmissions, and sub-optimal firing of internal combustion engines. Excessive torsional vibrations generated by the drive, or by variations in the load can cause failures in shafts or other drive components. Twist angle measured over a flexible coupling is an indication of torque. An electrical output triggered by torque overload can be used to shut down the drive in as little as 0.01 seconds. Monitoring of torque over a flexible coupling is useful for detecting overloads. If precise measurement of torque is required, especially over longer periods a calibrated torque tube may be used. Accurate monitoring of rotational speeds. The modular architecture of the system assists installation and subsequent maintenance. The systems have been tested to IACS and American Bureau of Shipping standards.